It captures the joy and energy of the day really well. After the boiling Summer sunshine of the Ammanford to Carmarthen walk in June, the weather for this walk was suitably seasonal too… although to call the rain “Autumn Showers” would not be a fair indication of the level of commitment of the walkers who turned up for this walk. It was POURING!! Most of us were soaked before we even got to the start! Luckily the start was at iSmooth community cafe, and iSmooth welcomes are always warm! Also keeping spirits up were children from Ysgol Bro Banw and Ysgol Gymraeg Rhydaman who had come down to wave us off and to have a go on iSmooth’s bicycle powered Fairtrade Banana Smoothie Maker. So, we headed off with smiles peeping out from under our hoods!! 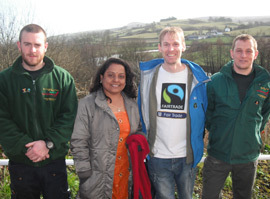 Walking along the road out of Ammanford gave a good view of how far Fairtrade has come, and how wide a range of Fair Trade products are available nowadays, even in a small town like Ammnanford. We all know about the amount of Fairtrade products available in the Co-Op, but in the first couple of minutes of our walk, we had passed Fair Trade clothes in Catherine Blair’s, Goodlife Fairtrade frozen food products (and lots more) in Jelf’s and Fair Trade crafts in Harmony. We carried on down to West End, where a very wet delegation from Ysgol Parcyrhun cheered us on our way. We posed together for a very quick photo opportunity, exchanged thanks and messages of respect for coming out for Fairtrade in this weather, then marched on. Down to Pantyffynnon, over the shaky bridge, and up towards Garnswllt, with me explaining to people how I had chosen this route for the good views down to Ammanford and over towards where we had walked before to Carmarthen. People lifted their heads to look at the rain and mist, smiled and continued. Still smiling! And the smiles widened as we approached the first stop: the new Activity Centre at the old school in Garnswllt. Shelter, tea, cookies… and the first of many welcome sightings along the way of support car driver Elen in her Fairtrade banana costume! The centre isn’t officially open yet, but hopefully it won’t be long. It looks like being a big asset to the local community and will definitely help to raise awareness of the beauty of the surrounding area. If you think of walking in the Swansea area, you probably think of Gower, but these hills above Ammanford have much under-rated beauty… in wind, rain or sunshine! And a good network of footpaths provide plenty of places to wander. Thanks to Ashley and Emina for welcoming us in, for not complaining about us making their nice new floors wet and muddy, for supplying much needed teas and toilets… and for posing for photos in Elen’s banana costume!! And the best thing about the stop was… the rain stopped too! Walking along the side of the hill, looking down on the meandering River Llwchwr… we could actually see it! And above us : Blue sky! We had two Geography teachers with us so they were happy to see text book river features. One of the Geography teachers (Kath) now works instead at Swansea Oxfam Bookshop. But the other (Tracy) left the walk at Pontarddulais to get back to school for last lesson. This, suitably, was a lesson about life in a shanty town in Kenya. School student Charlie also left at this point, to go to his A-Level History class. Let’s hope they will be studying the Fairtrade movement in History rather than Geography in years to come. And people will be amazed at the injustices of today’s Trade systems, like we are amazed when we look back at injustices of the past. “It is simply immoral that people should be allowed to suffer in order to provide us with luxuries such as tea, coffee and sugar”. That was a quote from the campaign to end slavery. But it is equally relevant to the campaign to end unfair trade. Anyway, I failed A-level History three times because I was interested in the politics but not the dates, so I will move on, wishing Charlie better luck than I had! Pontarddulais Co-Op provided the second welcome stop. And we ate our lunches, with Fairtrade bananas and more Fairtrade cookies for energy-giving pudding! The hill climbing was now over for the day, and the afternoon stretch started with a lovely walk by the river as the Llwchwr headed out to the sea. More history as we passed the site of a church that is now in St Fagan’s Museum of Welsh Life, and a motte and bailey castle, and then into a site of special scientific interest, and of very photogenic scenery. Next stop was at the studios of The Wave and Swansea Sound. This wasn’t a scheduled stop, but Elen had worked her magic, with the use of a Fairtrade Goodie Bag, to get them to do an interview about the walk. (She had also been on Radio Carmarthenshire in the morning, so we were spreading the message far and wide!). It was a little bit of busy road, and then a lot of cycle path all the way to the coast from there. Sadly, the slower pace as we admired views by the river, coupled with the Radio Station stop meant we were just too late to stop at Bikeability. By this time, we were focussing on finishing anyway, so a tea stop might have just made our muscles ache more… and The Railway Inn, just down the cycle path, was open for a toilet stop, so all was well. And on we went. And on. And on! That cycle path seems very very long when you are not on a cycle! I am always excited when I see the sea, but particularly so this time! Though the sign saying three miles to go lowered the excitement levels a little! It got darker and the moon got prettier as we neared the end. On through the Marina and finally into the lovely Environment Centre… Even more lovely tonight, with welcoming smiles from Swansea Fairtrade Forum… and soup and rolls made by The Red Cafe! We had a brief Skype link up with Costa Rica. It didn’t really work, but it’s the idea that matters anyway; the idea that the world is one big community and we should talk to each other to work together to make our world a better place. What did work was the cake! Last photo on my camera was David back in the Ammanford Co-Op store he’d opened up at 6am that morning before starting the walk, buying muscle soak foam bath! Another wonderful day of walking and campaigning and believing that a fairer world is possible. 'I’m delighted to see this new Fairtrade Walks initiative. As ramblers, we tend to be prepared for all weathers so flasks and chocolate are part of our collective DNA. Using Fairtrade drinks and chocolate gives us an extra warm glow. A coastal walk isn’t complete without those magical unplanned stops to take in the breathtaking views.